The lips are an important area of the face that easily show signs of aging and damage from such things as excessive sun exposure and smoking. Board-certified Manhattan plastic surgeon and general surgeon, Richard W. Swift, Jr., M.D., F.A.C.S., provides lip augmentation procedures to restore volume and symmetry to your lips, as well as reduce fine lines and wrinkles around the lips and mouth. Dr. 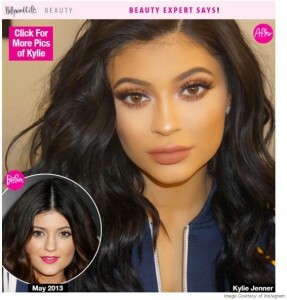 Swift provides lip augmentation treatments for patients in the New York and Tri-State area at his convenient Manhattan office.Think you want lips like Kylie Jenner? Check with Dr. Swift and see how he can help you achieve a lip augmentation the right way. The aging process affects every part of your skin and face, causing loss of volume and the appearance of lines and wrinkles. Your lips are no exception, and, in fact, this is one of the most vulnerable areas of the face, where damage from sun exposure and smoking is often visible. Many of us notice, as we age, that fine lines have appeared around the mouth, and our lips may look thin and undefined. We may find that lipstick and lip liner bleeds into the thin vertical wrinkles along the lip line, causing a messy look that makes us look aged and stressed. Lip augmentation, also called lip enhancement, is designed to restore youthful fullness to your lips while smoothing out fine lines around the lips and mouth. Dr. Swift weighs in on using fillers for Lip Augmentation and getting that perfect pout a safe way. Lip augmentation or lip enhancement may be achieved using injectable dermal fillers. Injectable dermal fillers are a safe, effective option for enhancing the size, shape, volume, firmness, and symmetry of the lips because these products add fullness while reducing fine lines and wrinkles around the lips and mouth. Typically, injectable dermal fillers last six to nine months before a follow-up treatment is required. As an experienced board-certified plastic surgeon, Dr. Swift will select the precise spots in which to inject the fillers in order to achieve the most natural results. The procedure may require multiple injections, so a numbing cream may be administered to help you relax and prevent any discomfort. The process of administering dermal fillers takes approximately 30 to 60 minutes, depending on how many injections Dr. Swift prescribes. No downtime or recovery period is required following the dermal injection treatment. Immediately following the lip augmentation or lip enhancement procedure, you will notice that your lips are fuller and more defined, but there may be some mild swelling, bruising, and tenderness, particularly around the injection sites, causing your lips to appear slightly fuller and bigger than you expected. The swelling will go down after about three days, and your lips will feel less swollen, soon returning to a more normal size. Dr. Swift offers several dermal fillers to choose from for lip augmentation, and will explain how each product works to enhance your lips. The injectable dermal fillers used in the lip augmentation procedure contain hyaluronic acid, a non-toxic, natural substance that naturally binds to water, causing lips to remain more hydrated, while also adding volume and fullness to the lips and reducing lines and wrinkles around the mouth. Restores fullness, volume and symmetry to lips. Reduces the appearance of wrinkles and fine lines around the lips and mouth. Prevents lipstick bleeding by restoring a more defined outline of the lips. Corrects lips that are too large or turned downward. You see results immediately after treatment. No downtime or recovery period required. Is Lip Augmentation Right for Me? Dr. Swift recommends lip augmentation for patients who are unhappy with the appearance of thin lips, vertical wrinkles around the lips, and a general lack of definition and fullness to the lips. Lip augmentation is recommended for improving the shape, size, volume, and firmness of the lips. Patients of all ages may be a candidate for lip augmentation, as even younger patients may desire fuller, more voluptuous lips, while mature patients may wish to minimize lines and wrinkles around the lips and increase definition and fullness. Lip augmentation may also be appropriate for improving the general balance of facial features in cases where the lips appear too small for the other features of the face. Dr. Swift may recommend lip augmentation for either the upper or lower lips, or both. During your consultation with Dr. Swift, he will ask questions about what you are most unhappy with regarding your lips and what you would like to correct. He will then examine your facial features and ask about your medical history in order to recommend the most appropriate lip augmentation procedure for you. How Much Does Lip Augmentation Cost in Manhattan, NYC? Because each patient will receive a customized, personalized treatment plan, the cost will vary between patients. Payment options include cash, check, and major credit cards, as well as easy financing options. The appearance of thin lips and vertical wrinkles around the mouth can make you look and feel unattractive. A lip augmentation procedure performed by board-certified Manhattan plastic surgeon and general surgeon, Richard W. Swift, Jr., M.D., F.A.C.S., can restore fullness and definition, smooth wrinkles, and bring a more youthful appearance to your lips and smile. Please contact our office to schedule your first appointment with Dr. Swift today.